Relive the Golden Years of the 1970's pop with the "Abbasolutely" Brilliant Tribute! with Amelinde Hernandez, Juliet Williams, Jose Huelga and Warren Webley. Featuring songs from the New Movie! 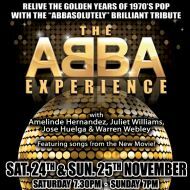 Saturday at 7.30pm and Sunday at 7pm.